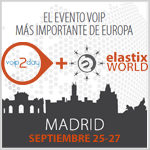 Olle E. Johansson, founder of Edvina, delivered a talk called “The Hidden Secret of TCP/IP – and How it affects your PBX” at the Voip2day + Elastixworld 2012 conference in Madrid, Sept 25th. The talk describes the background for the SIP2012 project and what needs to change in order to get back on track with realtime communications. The presentation was uploaded to Slideshare and quickly got over 38.000 views, taking it to the top of the week list on Slideshare.net and got many comments, referrals and tweets. A video of the talk will be uploaded to the Voip2day.net site in a few weeks time. Voip2day + Elastixworld was a European Voip event that got over 1.000 visitors during three days, with a very interesting exhibition. Avanzada7, an Edvina partner in the Open Unified Alliance, has organized Voip2day in Madrid for many years. – “I’m very proud of the reaction by the community – it shows me that Interoperability is still a hot and important issue. Hopefully the SIP2012 project will be able to raise the bar and take SIP away from the old PBX model and move it into the world of Open Unified Communication” says Olle. Many people asked “What can we do?“. The answer is partly in the presentation – base your realtime multimedia architecture on a modern view of communication, instead of a 50 year old PBX model. Chat, presence, video and other applications, like desktop-sharing, needs to be part of the architecture. Require vendors to implement more than the 10 year old SIP 2.0 specification – follow the SIP2012 project and write better requirements when purchasing SIP products and services. Finally, make sure that your vendors participate in the SIPit interoperability test events with all their SIP products. It’s at SIPit vendors meet to test their products and improve the interoperability as well as the standards.